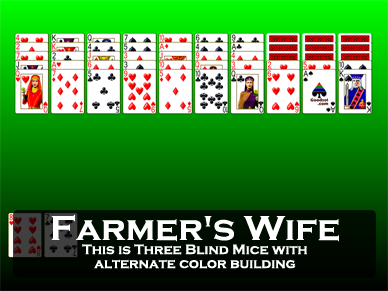 Screen shot of the game Three Blind Mice from Pretty Good Solitaire. Three Blind Mice is a one deck Spider type game. 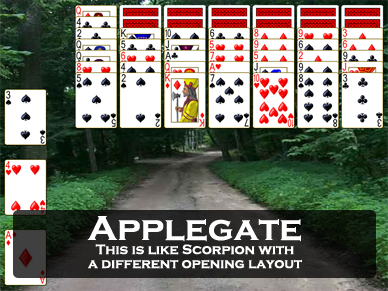 At the start of the game, the deck is dealt to ten tableau piles, 5 cards to a pile. In the first seven piles, all of the cards are dealt face up, in the last three piles two cards are face up and three cards are face down. The remaining two cards in the deck are dealt one each to two reserve piles. These cards are available for play on the tableau piles at any time. Among the ten tableau piles, build down in suit. 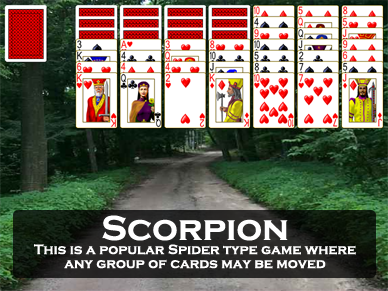 Groups of cards regardless of any sequence can be moved as a unit (Yukon or Scorpion type group moving). The object is to build four 13 card sequences down in suit from King to Ace in the tableau. This is the same object as in the game Scorpion. 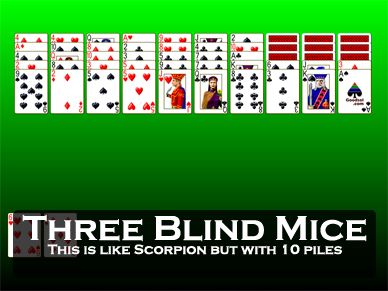 In short, Three Blind Mice is a Scorpion variant with the same method of play, just a different starting layout. 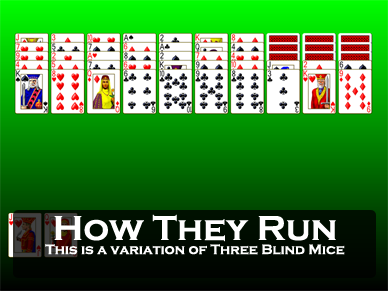 Three Blind Mice is a difficult game, with players averaging a 17% win rate. Good players can score in the 20-30% range over large numbers of games.